You have all heard the phrase ‘The rains are comin’ ma‘. Well they have now thankfully all finished up here in Bowen, North Queensland. Last week alone we received over 700mm of rain. Bowen itself had escaped much of the torrential, flooding rain over the summer months, as we usually do, even though this year’s rainfall was much higher than recent years. The lawns and parks are looking an absolute treat though. already and the sun is a pleasure to be in. Walking along the shores of Queens Beach on day break is just magic at the moment, as the photograph above shows. tranquillity of a small town surrounded by the beauty of our beaches? 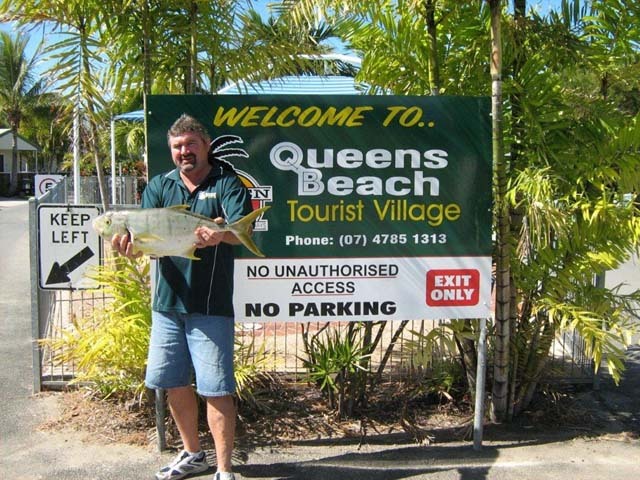 Guests at the Queens Beach Tourist Village in Bowen reckon, “Nothing wrong with the fish but the bloke holding it looks a bit ordinary.” Lucky park owner and operator, Craig Witts, does not take offence to their remarks. 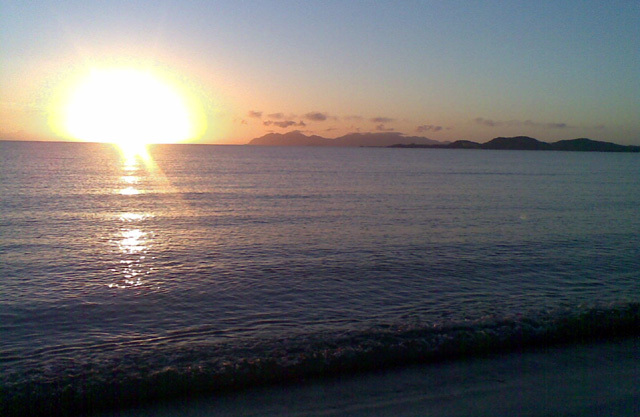 It is that time of year again when the temperature and seas are near perfect in Bowen, North Queensland. And, the mackerel and trevally are back on the bite. Some days, there would be close to fifty boats sitting out on the mackerel patch just of our shores. There is plenty of fun to be had and the warmth provided by North Queensland’s winter sun makes it a pleasure to be soaking up those rays. Is Bowen in Queensland to be renamed Bowenwood? “For a time they called it Little Hollywood – or, to be exact, Bowenwood, the name that adorned the town’s water tower in giant letters when Baz Luhrmann came to town. You’d struggle to find a candidate less likely for that accolade and that is not meant as an insult. It can even be taken as a compliment, because Bowenites would agree their town is hardly glamorous – and they’re proud of that. So it becomes a curiosity. Why Bowen? The quick answer is this: because Bowen is a little beauty, an off-the-track gem whose beautiful beaches and low-key charm made it worthy of popular discovery long before Hollywood came calling. It was just that no one expected that discovery to happen quite as it did – Luhrmann, after a nationwide mission scouting locations for Australia, telling the world that his $100 million blockbuster would be filmed … where? Talk about casting an unknown; a town previously known for its fine mangoes and not much else. But Luhrmann fell in love with the place and the people, a collection of north Queensland characters whose blend of civic pride and gentle good humour offered his huge production team a warm welcome and all the help they needed, delivered with minimum fuss – and a recognition that, if nothing else, it was going to be a whole lot of fun. A tourism boom? Maybe. Fun? Definitely. And what an adventure it turned out to be. I’ve visited Bowen twice, once for a month in 2007 when it was Hollywood Bowen, during filming, then again last year to see how things had changed. And that is partly what makes Bowen special: they hadn’t. First impressions, gathered when the town’s harbour had been transformed into 1940s Darwin and Nicole Kidman was a regular in the local fish-and-chip shop, held true two years later. 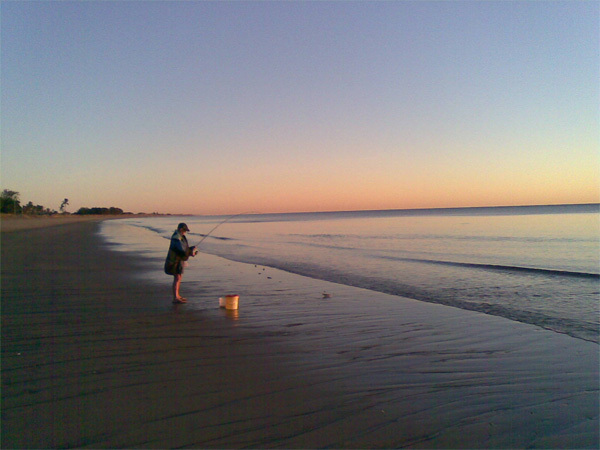 There are seven main beaches, as well as many small coves and inlets that reward exploration. Armed with a map and my hire car, I set off and without much effort stumbled on paradise. That winter morning was passed alone on a large, warm rock, in sole possession of an isolated patch of paradise that had me gasping at the setting – and my cleverness in finding it. Your browser may not support display of this image. Bowen’s like that, full of little discoveries that seem to be secrets. The main beaches are all worth a visit, depending on what you’re looking for. Horseshoe Bay is the most popular because of its proximity to hotels, camp grounds and restaurants. During filming, it was the backdrop for an endless series of paparazzi stakeouts of Hugh Jackman, who regularly took his children bodysurfing in the gentle waves. Jackman was also a fan of the long and lovely Queens Beach, where the rocks and small pools that cradle each end of the five-kilometre stretch offer plenty of diversions in the way of marine life. Indeed, my big surprise was that Bowen’s main assets are all centred on the ocean. It was a surprise because driving into town for the first time, you’d never guess it. Above ground, this is fruit-and-vegie crop country; below ground is mining territory. On approach there is nothing to suggest the coastal beauty that awaits you. But the town’s official slogan – “Where the bush meets the beach” – tells you all you need to know. The countryside is an unexpected blend of the Australian bush running against what most of us think of when we hear the word “Whitsundays”: beautiful beaches and endless entertainment on or near the water. Recreational fishing is popular and you can charter a boat, join a group expedition or take it easy and go group sailing. There are dozens of small islands to explore offshore and bigger ones, too, if you go further out – Bowen was once the departure point for Hayman Island. Better still, far from the crowded and costly reef trips elsewhere, the town is also ringed by coral. I’m no diver but a tame snorkelling afternoon revealed a jewel box of underwater glories. Cost? Zero. The town is like that – it won’t tax you financially or physically. There’s no frenetic resort activity here. Bowen leaves you be. In many ways, it reminded me of the seaside holiday towns of childhood – trips devoid of pricey diversions aimed at satisfying our modern demand to be constantly stimulated and entertained. You don’t go to Bowen for glamour, excitement, crowds, fine dining, nightclubs – or an empty bank account. It’s that simplicity that made Jackman such an enthusiastic convert. For the run of the shoot, Jackman was an unassuming local hero (popping up on the beach, at the pie shop, in the gym, taking his children to school) and he told anyone who would listen that Bowen was special because the locals didn’t treat him as if he was. Even Kidman let down her guard, bopping with locals in the pub, going to the movies at the glorious art deco Summergardens cinema, chatting with locals in the fish shop. And I’d wager that in the end it’s the locals you’ll remember long after you’ve gone. On my second visit I was welcomed back like family, so what had disappeared didn’t matter. The film sets were torn down long ago, the stars moved on and there was little sign that Hollywood had ever been here. And that tourism boom? Never happened, really. Qantas, Jetstar and Virgin Blue fly from Sydney to the Whitsundays’ gateway airport at Proserpine, direct or via Brisbane depending on the day of travel. Bus services operate daily between Proserpine and Bowen, 80 kilometres away. Posted on May 11, 2010 Author JohnCategories Caravan ParksTags Bowen Queensland, Queens Beach Tourist VillageLeave a comment on Is Bowen in Queensland to be renamed Bowenwood?